Classic – FOOD IS LIFE! 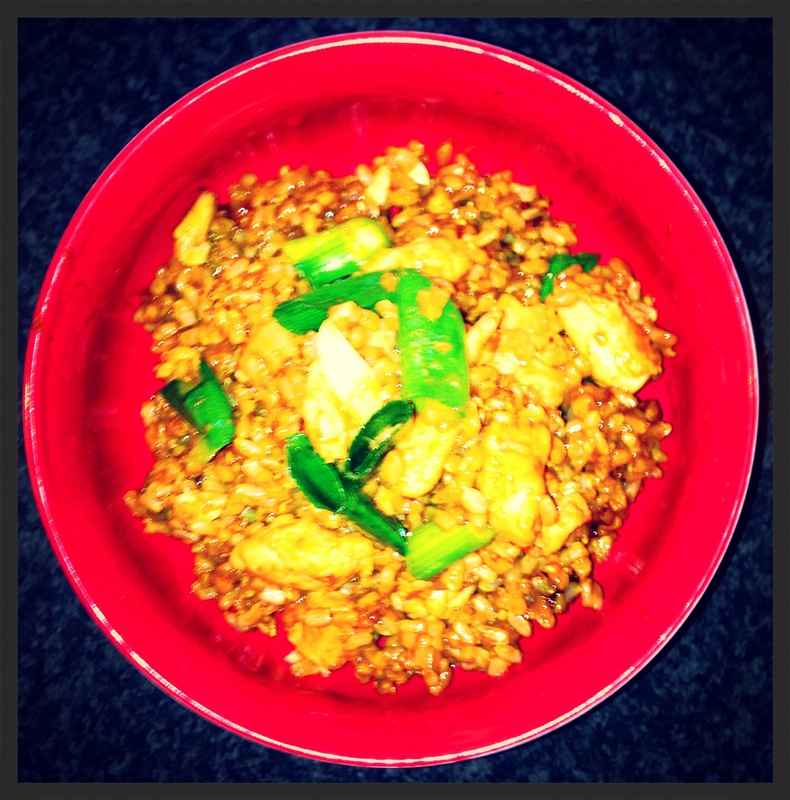 Karina’s Low-Gi and High Protein Fried Rice! Grab a medium-sized pot, then pour water into it, until it reaches 3/4 of the way with water. Place the lid on your pot. Turn the heat to ‘high,’ then bring this water to a boil. Once the water has boiled, remove the lid and stir in 1 1/2 cups of brown rice. Turn the heat to ‘medium,’ then cook, stirring occasionally, for 35 minutes. Once your rice has cooked, turn the heat to ‘off,’ then drain your rice, and return your rice to your pot. Place the rest of your ingredients, except for the shallots, all together in that pot, along with your brown rice, then cook on ‘low,’ for about 5 minutes, or until the chicken has cooked. Make sure you stir your rice every few seconds, to prevent it from burning. Karina’s Low Gi and Low Fat Spaghetti Carbonara! Cook your pasta as per the packet directions, strain, then set aside with the lid on. Make your low-fat carbonara sauce. On medium heat, melt your olive oil spread in a medium sized pan, then add your wholemeal flour. Stir together constantly with a wooden spoon, until a ball forms. Once this little ball forms (after 1 minute of constant stirring), then you will need to grab your whisk. Add your milk to the mixture, one little pour at a time, then whisk constantly until all the milk has been incorporated and the sauce has thickened. At this stage, it is entirely up to you whether you like a lot of sauce with your carbonara, or a light coating. If you prefer a light coating on your spaghetti carbonara, then only use one cup of light milk. If you prefer more sauce, then you will need to add one and a half cups of light milk. Once your sauce has thickened, then you will need to add all your low-fat cheese, using the whisk to incorporate all the low-fat cheese into the sauce, then add a large pinch of white pepper. Whisk well until the pepper has been incorporated. Turn the heat to ‘off’. Using a separate frying pan, turn the heat to a medium heat, then add your 1 tablespoon of olive oil. Once your olive oil has warmed through, add your bacon and chicken pieces to the pan, then fry on both sides, until slightly caramelised and fully cooked. Turn the heat to ‘off’. Add your cooked chicken and bacon pieces to your low-fat carbonara sauce, then stir well to combine. 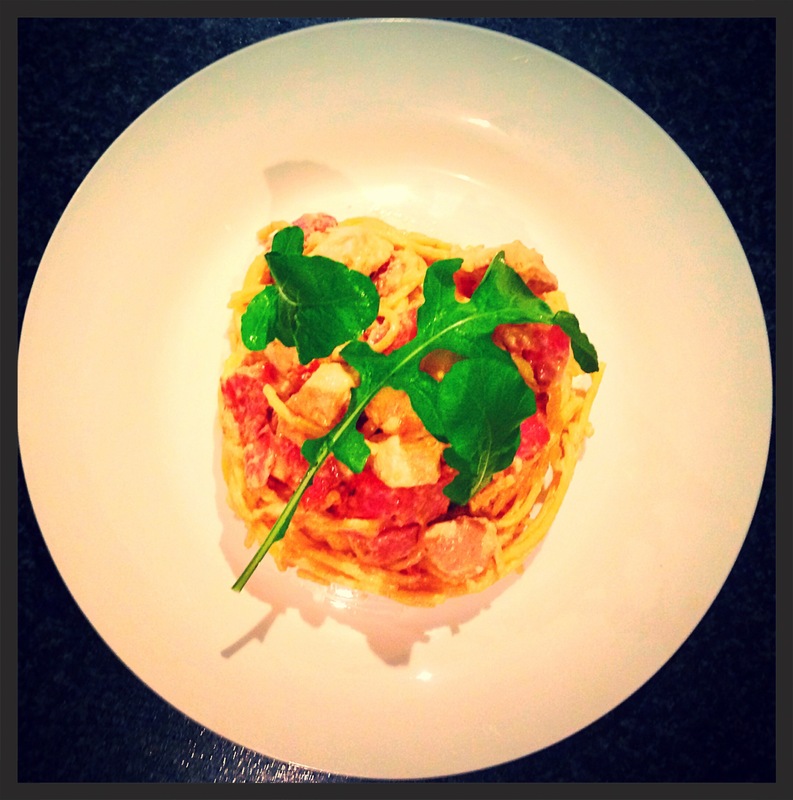 Stir your cooked pasta in with your low-fat carbonara sauce, chicken and bacon, then serve on a plate. Top with fresh rocket! 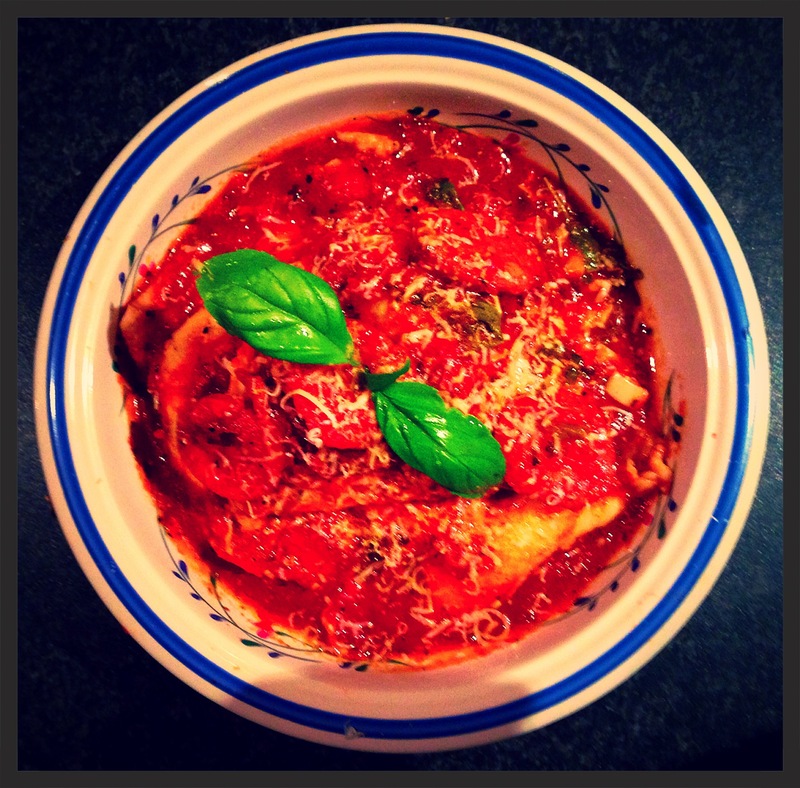 Karina’s ‘Saucy’ Chorizo, Spinach and Ricotta Ravioli! Fill your kettle with 1.5 litres of water, then bring to the boil. Once water has boiled, place your torn spinach into your heatproof bowl. Cover your spinach with boiling water, then drain immediately. Rinse your blanched spinach in cold, fresh water, then squeeze your spinach well with your clean hands, to remove excess water. Place your cooled, blanched and squeezed spinach into your mixing bowl, then add 30g of shaved fresh parmesan, cracked black pepper and fresh reduced fat ricotta. Mix well to combine evenly. On medium heat, add 1 tablespoon of olive oil to a medium-sized pot, then wait until oil has heated. Once oil has heated, add your chorizo sausage. Allow your chorizo sausage to caramelise on one side, for approximately 2 minutes. Once caramelised on one side, flip your chorizo sausage pieces over, to allow to caramelise for 1 minute on the other side, then turn the heat to a low heat. Add your minced garlic and allow to cook for 1 minute. Deglaze the inside bottom of your pot, by placing your balsamic vinegar in with your caramelised chorizo sausage. Wait only 15 seconds, then pour your chopped tin tomatoes in with the chorizo sausage. Add your dried mixed italian herbs, along with your tomato paste, then stir to combine. Allow your sauce to simmer for 30 minutes, keeping the heat on low. Tip: you can have your sauce simmering while you are making your pasta 🙂 Just ensure your sauce does not burn, by stirring occasionally and keeping the pasta sauce on a very low temperature. Once your ‘Saucy’ pasta sauce has simmered for 30 minutes, turn the heat to off, then add your torn fresh basil to your sauce. 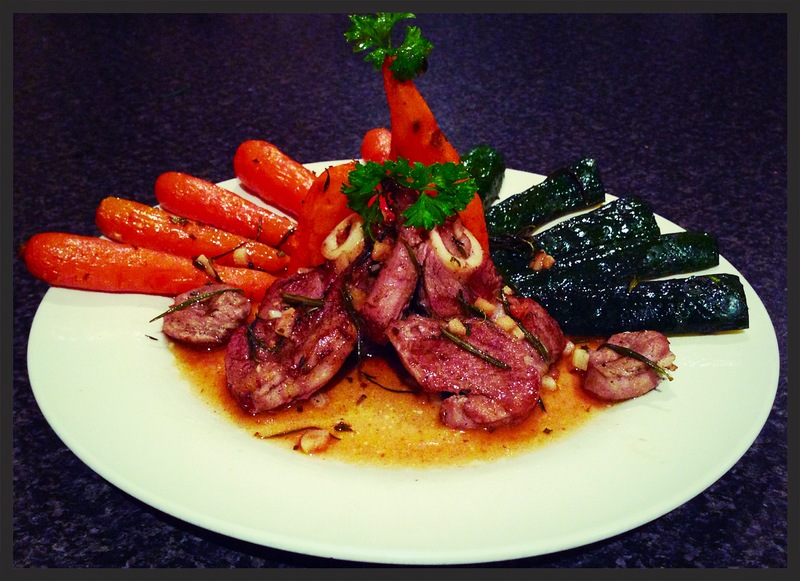 Stir briefly, then set aside to infuse these fantastic flavours! Combine all the flour into a large bowl and make a large indent in the middle. Add the eggs and 2 tablespoons of olive oil to the centre. Use a fork to mix the eggs until combined, then use your fork to gradually bring the flour in from the outside. After most of the dough is roughly combined, flour your clean hands and bring all the dough together to form a big ball. Knead on a floured surface for approximately 2-3 minutes, or until smooth and slightly resilient. If your dough is too wet, add more flour. If your dough is too dry, add more olive oil. Wrap your large dough ball in cling wrap, then leave in your refrigerator to relax for 1 hour. Cut your pasta dough into three even sections, keeping one section in front of you. Wrap the other two sections in cling wrap, then place in your refrigerator. Using a very large rolling pin and a large, flat surface, roll out your first pasta section, ensuring the dough is about 1.5 mm in thickness. Cut your dough into square pieces. Place one square pasta piece on a flat and floured kitchen bench, then place a level tablespoonful of your fresh ravioli filling into the middle of one piece of pasta. Brush the entire boarder with water, then place your other square piece of pasta over the filled one. Press both pasta squares together, around the boarder, to form a solid bond. Repeat with your remaining pasta squares and filling. Repeat this process with your other two pieces of pasta dough, placing your completed ravioli batches in a container in the refrigerator to keep moist and to prevent from drying. Place cling film to separate the pasta from each layer of pasta, in order to prevent your pasta ravioli from sticking to one another. For the ‘Rolling in Happiness’ option, you’ll need a pasta machine. Cut your pasta dough into three even sections, keeping one section in front of you. Wrap the other two sections in cling wrap, then place in your refrigerator. Flatten your first piece of pasta dough by hand, then run it through the thickest setting on your pasta machine. Put the pasta rollers down two settings, then run the pasta dough through again to make it thinner. Fold your pasta dough in half, then run it back through the thickest setting again. Repeat this process two more times, or until your pasta becomes silky-smooth. Roll your beautiful pasta sheet down through each setting, dusting with wholemeal flour before using each setting. Roll your beautiful pasta sheet to your desired thickness, which is about 1.5mm for wholemeal pasta dough. You don’t want wholemeal pasta dough rolled too thin, otherwise it may crack due to the wholemeal grains. Place a gow gee pastry on a flat and floured kitchen bench, then place a level tablespoonful of your fresh ravioli filling into the middle of one pastry. Brush the entire boarder with water, then place your other gow gee pastry over the filled one. Press both pastries together, around the boarder, to form a solid bond. Repeat with your remaining wrappers and filling. Bring a large saucepan of salted water to the boil. Once your water has boiled, add your beautiful and fresh ravioli to the boiling water. Stir once then cook over medium-high heat for 8 minutes, or until your ravioli float. Drain, then divide among 4 deep bowls. 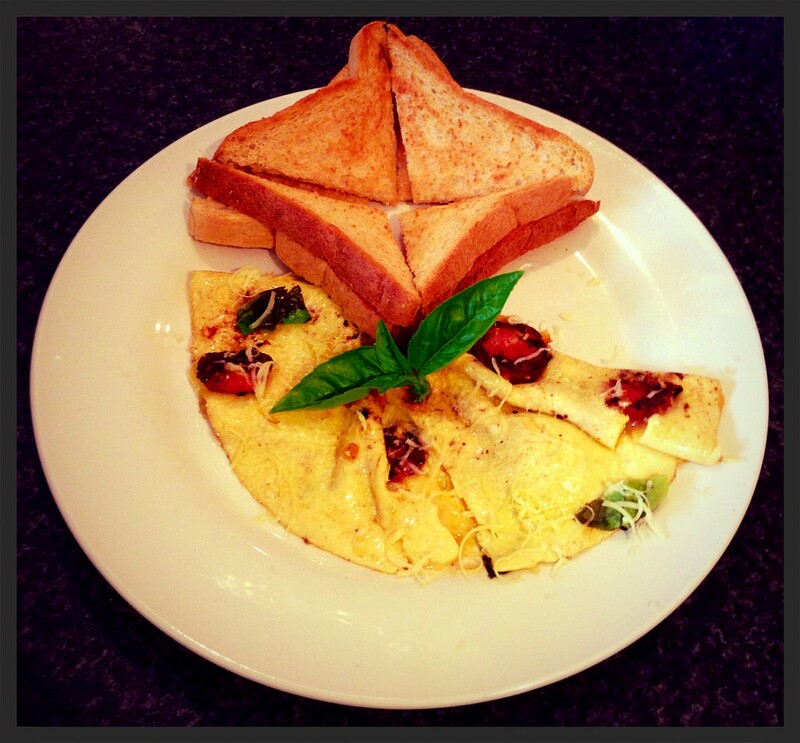 Serve with your ‘Saucy’ pasta sauce, along with your grated fresh parmesan and a fresh sprig of basil. Bring a large saucepan of salted water to the boil. Once your water has boiled, add your ravioli to the boiling water. Stir once then cook over medium-high heat for 4 minutes, or until your ravioli float. Drain, then divide among 4 deep bowls. Serve with your ‘Saucy’ pasta sauce, along with your grated fresh parmesan and a fresh sprig of basil.